Question: What are the best color(s) of Hogy sand eel to buy and what time of year is best to fish them? Answer: Sand eels are everywhere on the Cape, less so close to the south shore from Falmouth to Harwich, but anywhere else they are a sure thing. Move south to the Islands and again they are prolific and the dominant forage. It seems obvious, but the locations with sand have more of them, or less of other types of bait fish. 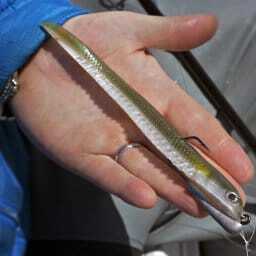 Even if you guess wrong on the bait fish around, chances are they are similar in size or shape to sand eels. If you were to break it down by time of year, it would start in Buzzards Bay. May-June – The fish you find outside of the west end of the canal are more than likely on tiny, finish nail sized sand eels. 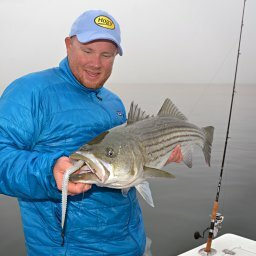 Those schoolies are usually migrating first of the year in the 20-28” range. For that period I prefer the smaller 4.6” sand eels in just about any color but if I had to pick one, it would be the Light Sand eel as the small baitfish are almost translucent. 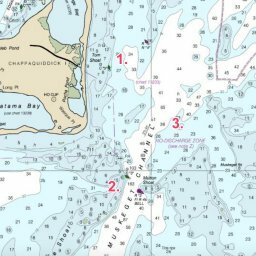 Early/Mid June through July – As Bass move up through Cape Cod Bay and past the sandy shoals of Barnstable Harbor, Brewster Flats, Billingsgate Shoal, and up to Provincetown I tend to upsize. Even if the bait I see in the water is smaller, I will err on the larger side hoping to get attention amongst the thick schools of bait. Here I will go to the Olive or Light 6.6” skinny. 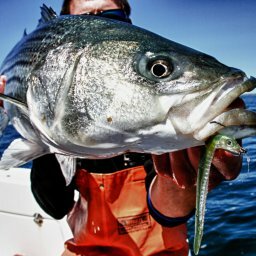 Through the late spring and early summer when I start fishing more in open water, jigging deeper, or down the back side of the Cape and Chatham I will upsize again, as well as darken the color. Now I switch to the 7″ Jumbo in Dark. The offshore sand eels are different in shape, speed, and color than their inshore cousins. They are faster and much darker in color. They look more like American eels, black backs with silver or white bellies. If I had to pick one all around sand eel it would be the 6.6″ Skinny in Light color. That bait offers the best of all worlds. Late Summer & Fall – I use the larger 6.6″ and 7″ and then as the season starts to reverse and fish move south to migrate, I reverse the size and lighten the color again. 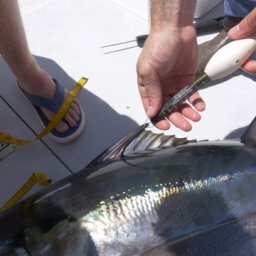 By mid-fall when bonito and false albacore fill in, again I will go to 4.5″ sizes out around the Islands. On the right day I will go unweighted, there are few hookups more fun inshore than an albie crashing an unweighted plastic on the surface. Some Other Tips – Rig them a bit different than you would a larger 10″ plastic. Sand eel baits are softer plastic than larger Hogy’s. This gives them a tight quiver action through the water even when fished at slow speed. You can fish them with Barbarian Hooks or Jig Heads, but I think they produce best with Classic Weighted Swimbait hooks. I like the 1/0 0.2oz Classic for 4.5″ eels and 3/0-4/0 .25oz for 6.6 or 7″ Eels. For larger bass in deeper water, or to get better casting distance in wind I will sometimes upside to a 6/0 .5oz Classic with the 7″. I prefer the classics for eels because the exit point of the hook is closer to the head of the plastic than the longer barbarians. Coupled with the softer plastic of the Sand Eels this gives them a lot of body movement as the lure swims, letting the ribbed design do its job over the length of the lure. Like I said swim them slow, let the lure do the work. The most common mistake I see people make with them is to not give them adequate time to sink (double what you think is right), and they retrieve them too quickly. 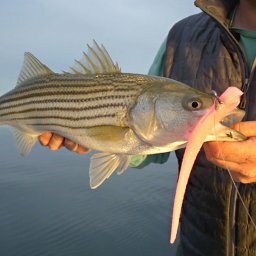 When striped bass make their initial push up through Martha’s Vineyard and Buzzards Bay in early May, one of the most surefire ways to find them from shore is to target the boulder fields that dot the area. I met with Capt. 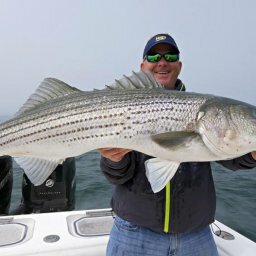 Terry Nugent on Wednesday morning for my first trip on Riptide this year, and had a phenomenal day catching fish to 45″ on topwater in front of Barnstable Harbor and on the jig near Provincetown.